‘We have nothing to gain by helping any other country to become a threat to India,’ former Sri Lanka president Mahinda Rajapaksa, who is on the comeback trail, tells Rediff.com senior contributor Nitin A Gokhale in an exclusive interview. 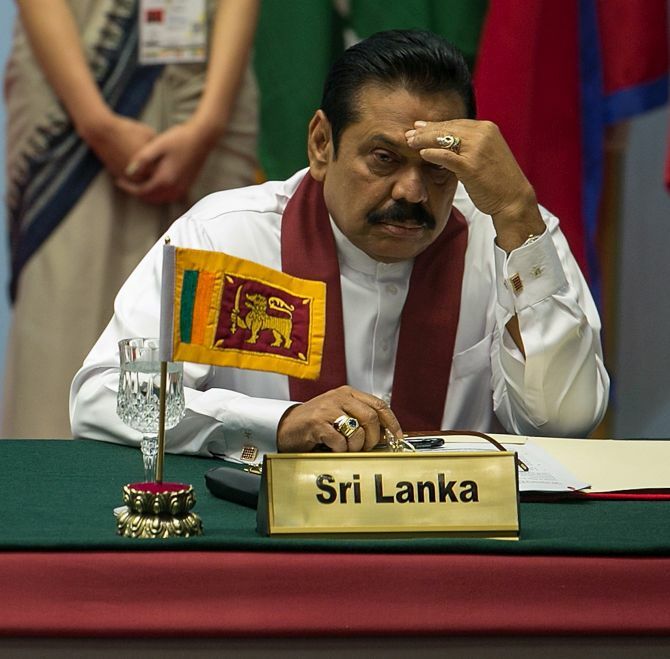 Mahinda Rajapaksa, who lost the Sri Lankan presidency earlier this year, plans to contest the parliamentary election and likely become prime minister. He spoke exclusively to Rediff.com contributor Nitin A Gokhale. Will you be a prime ministerial candidate in the upcoming parliamentary elections? If yes, will you be the SLFP candidate? I will be contesting the parliamentary election with a view to forming the next government. The United People’s Freedom Alliance has extended an invitation to me to contest on their ticket which I and the constituent parties of the UPFA along with the majority of the former SLFP (Sri Lanka Freedom Party) parliamentary group have decided to accept. We contested the 1994 parliamentary election as the People’s Alliance. Ten years later, for the 2004 parliamentary election, we reconstituted our alliance as the UPFA. It was being discussed whether a new alliance should be formed to contest the forthcoming parliamentary election but that will not be necessary now that everyone has made the decision to contest under the UPFA banner. I have been a loyal member of the SLFP from the inception of my political career. How do you assess your support in the country? The most visible political phenomenon after the presidential election of January this year is the groundswell of support that has built up for me in the country. There have been unprecedented crowds at any event attended by me or held on my behalf. The large number of politicians at all levels of government supporting me have done their own assessments and they know that the people are with me. In many ways this support is now more obvious than it was in 2005 and 2010 when I won the presidential elections. How is your relationship with President Sirisena? Have you mended your differences with him? The fact that politicians contest against one another does not mean that they have to be enemies. I contested against Mr Ranil Wickremesinghe in 2005 and I won. But I never regarded Mr Wickremesinghe as an enemy. I have always maintained cordial relations with the Opposition which is why so many Opposition politicians ended up joining my government. As for President Sirisena, I maintained good relations with him during and after the presidential election. Going your separate way at times is a part of politics. President Sirisena and I have been members of the SLFP for decades and we both want to see the SLFP remaining united. If you win and do become PM, wouldn’t it be odd for you to work under a man who was a minister under you when you were President? The position of prime minister is now different to what it was before the 19th amendment to the constitution was passed. The PM has a certain defined role to play. I do not see any problem at all in working with President Sirisena in that capacity. How do you assess the six months of this government since January? The past six-month period can in fact be described as the worst period of economic failure in our post independence history. We have had unsuccessful and reckless economic management in the past, but never of this magnitude. Although some of the political reversals can be put right with a change of government, the economic fallout will be more difficult to rectify because investor confidence has been very badly damaged by this government. When I handed over the government to the present set of rulers, the country was experiencing the fastest growth in the whole of Asia. The inflation rate had been at single digit levels for more than 6 years. Interest rates had been at a reasonably low level in the single digit range. The exchange rate was steady for over five years. Our foreign reserves were at an all time high of $8.2 billion. The national debt ratio had been reduced from a high of 92% in 2005 when I took office, to a more manageable 75% by the end of 2014, notwithstanding the massive infrastructure development carried out by my government. Per capita income had increased from $1,240 in 2005 to $3,650 by 2014. Many foreign investors acknowledged that we had the one of the best run economies in Asia. But today, just six months later, everything is in shambles. The economy has slowed down; all infrastructure development has stopped; foreign reserves are going down sharply; unemployment is soaring; government finances are in complete disarray with revenue in decline and government expenditure going out of control; the rupee is sliding rapidly against the USD. In addition to all this, the apex institution of the banking system, the Central Bank is ired in a financial scandal that has so far cost the government over Rs 55 billion. Never in living memory have we had an economic catastrophe of this magnitude in such a short period of time. What will be your main campaign plank in the upcoming elections? We have three main priorities — to put the economy back on track, to dismantle the Police State apparatus set up by the UNP government and to restore democracy and to deal with threats to our sovereignty and national security that have arisen since January this year. How will you win back the trust of the minorities who it is widely believed, voted in large numbers against you. My government rescued the Tamil people of the North and East from the LTTE. Now their children are not being forcibly recruited by a terrorist organisation and they can lead a normal life. Many Tamil people realise this which is why the number of votes I got from the Tamil people of the North doubled between the presidential elections of 2010 and 2015. But for the past six decades or more, the Tamil people have been misled by their leaders who have been showing them the mirage of a separate State. At the presidential elections, the Tamil people are told to vote for a candidate who would help them come closer to that goal. I can’t compete with that. But what I can do is to give the Tamil people the same facilities and opportunities that everyone else in this country has, and there is no leader who has given the Tamil people more in that respect than I have. Our party used to get a certain proportion of the votes from the Muslim community, either directly or through Muslim political parties allied with us. From 2012 onwards, Western powers promoted various anti-Muslim extremist groups to disturb the peace that our government had established. The leaders of Muslim political parties saw this as an opportunity to increase their votes and they spread the story that my government was sponsoring these extremist groups. Many of the Muslims who voted against us would by now have realised that my government had nothing to do with these extremist organisations and that the latter are in fact opposed to me. How do you see the recent US report that the LTTE’s overground support network is still intact? We defeated the LTTE’s war machine in 2009. But their overseas financial and political networks based in Western countries continued to remain active. The LTTE rump now uses these funds to buy influence in Western capitals through which they expect to achieve their goal of a separate State. Prime Minister Ranil has challenged you for a straight contest? Will you take up the challenge? Absolutely. Mr Wickremesinghe contested against me in 2005 and thereafter never faced me at an election. This time around, he is compelled to face me because there is no way of escaping the contest. Will the India-China rivalry in Sri Lanka once again be a political campaign point in the upcoming elections? Sri Lanka has always had close relations with China from the early 1950s onwards. India’s concern about Sri Lanka’s relations with China is a new phenomenon which has come about in the past few years in the context of the rivalry between India and China as the world’s rising superpowers in Asia. We need to maintain good relations with both India and China. Sri Lanka will never pose a threat to India, and we have nothing to gain by helping any other country to become a threat to India. In this context I wish to recall the role played by our late leader Mrs Sirimavo Bandaranaike who mediated between India and China in the Sino-Indian war of 1962. My government was too absorbed with domestic issues such as the war against terrorism and development to play a role in international affairs like Mrs Bandaranaike. But the role that she played during the Sino-Indian war of 1962 has great relevance today. I intend doing what I can to be a bridge between these two rising superpowers. Alea iacta est; the die is cast.